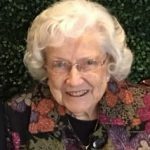 FORT WORTH — Charlene Layne McCreight, retired educator, went to be with her Lord and Savior on Thursday, January 17, 2019. FUNERAL: Visitation: 5-7 p.m. Tuesday at Biggers Funeral Home, Lake Worth, Texas. Service: 10 AM Wednesday at Grace Community Assembly of God, Flower Mound. Interment: 4PM Wednesday at Union Grove Cemetery in Troup, Texas. In lieu of flowers, memorials can be made in her memory to: Roever Foundation, P.O. Box 136130, Fort Worth, Texas 76136, or online at roeverfoundation.org. Charlene was born in December 1929, in Smith County, to Joseph and Savanah Layne. She graduated in 1946 from Salem High School in East Texas. She graduated from Texas Wesleyan College while working as an administrative assistant to the president and later earned her Masters degree from Texas Women’s University. Early in her work life, Charlene served on staff at the Edna Gladney Home. Thereafter, she entered the field of middle school and primary education in the Eagle Mountain Saginaw School District. After retirement, Charlene served as the President of District 11, Texas Retired Teachers Association. She also volunteered with the Educational Foundation hosting 7 foreign exchange students. Most recently, Charlene was a member of Grace Community Assembly of God. She is survived by her daughter, Debra Spiegel and husband, Scott; son, James McCreight and wife, Linda; grandchildren, Savannah Brown and husband, Aeron; Suzanne Lanier and husband, Brad; Stone Spiegel; Elizabeth McCreight, Lauren McCreight; great grandchild, Addison Lanier; brother, Newburn Layne, wife, Ruth; sister-in-law Dianne Layne; and seven nieces and nephews. cont. About 10 years ago when I wasn’t working, I was able to join the women’s prayer group on Tuesdays. Charlene and a few other ladies were the fixtures and the leadership for this group. It is a blessing to see how it has grown in fellowship and strength. We have many mighty prayer warriors. My sympathy for all the family and friends because we will already miss Charlene here in this life. I have great joy that Charlene is now in the presence of the Lord! We will remember her guidance ,her kindness and warmth,and sense of humor. We have made a donation to the Roever organization in honor of Charlene, and encourage others to do so to honor this great teacher! Love, Adrienne & Paul Abrahamson, and April and Dan Prillaman. Charlene was a friend and role model. She was one of the reasons I chose teaching. Her passion, and faith showed through her actions and words. As a student, she encouraged success but didn’t mind teaching the “moral of a lesson” when you needed correction.I appreciated her concern for all students and their success- in and out of the classroom. She was definitely an asset to the Eagle Mt Saginaw ISD- by sharing her passion of teaching and learning. Thank you Mrs McCreight for your unending love for your students- and your Patience with those who preferred talking instead of listening! I always loved visiting with Charlene through the years when we attended family events. She was a lot of fun and always had interesting things to share. I will miss her but I’m grateful she is now celebrating with Jesus. Praying for comfort for all the family. Charlene was a very special lady. Very sweet and giving. A true Christian and such a positive kind soul.